Both questions are typical self evaluations, Stack Exchange runs them on all young Beta sites and as you may have noticed they are essentially polls, a series of example questions from the site that we are supposed to vote on. I didn't spend more than a few seconds on any question, as I'm fairly regular on the site and I've already read all of them while casually browsing the site. In fact, if my memory isn't failing me, I had voted (up/down) and/or commented, and/or voted to close on each of the 20 example questions. I might have spend a minute or two re-reading a couple, but I mostly scanned through them. In any case I think my voting pattern is quite normal, and the script should be somehow tweaked to take serial posts, posted by the same user in quick succession, into consideration, especially on Metas. Since I had anticipated that the script would kick in, I could have tried to fool it by pausing a bit between votes or trying to look for other Meta posts to vote on, in between voting on the evaluation answers. However I'm a very active voter on Meta Workplace, there aren't many posts I haven't already voted on, and the few that I haven't is probably because I neither agree or disagree with (my opinion on them is simply "meh"). In any case I think my voting behaviour was natural, and although the serial voting script is awesome, this time it caught and reversed a perfectly legitimate behaviour. Yes, please implement this on Area 51 proposals too! Oftentimes a single user would suggest a plethora of "example" questions to their own proposal which are just terrible, yet all of everyone's votes get reversed and the question just sits there at 0. I've noticed several times that my votes have gotten reversed. I haven't noticed it myself, but it certainly seems plausible, especially early in a proposal's life. Mysticial found a related discussion, "Should this be picked up by the vote fraud detecting algorithm? ", but it's focused on voting patterns on main sites, where reputation is also a factor. I can understand jumping through hoops to satisfy the script on main sites where, unfortunately, there are a lot of people trying to get some cheap rep or "punish" others with their downvotes, but not on Metas, and especially not on these evaluation posts. 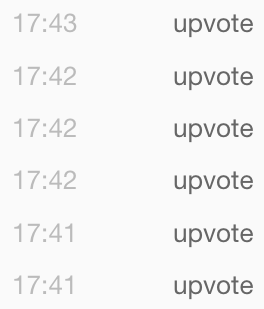 The script should simply count multiple votes on posts of the same question as one, no matter how many are voted on. It is natural behaviour to read through a question and its answers and potentially vote on all of those posts. For example, voting on both a question and a self-answer to it is something the script shouldn't regard as serial voting, you are still voting on the same page. Or if a user posts multiple answers to the same question, voting on all of them is again legitimate voting behaviour. Serial voting is about deliberately seeking out posts from a specific user and voting on them, so multiple votes on the same page should not count towards it. In most common cases this just doesn't make much of a difference, but the evaluation posts highlight this weakness of the script. Metas should be excluded from the serial-vote-hunting script. Votes on meta signal agreement/disagreement and don't affect rep (except MSO). Therefore the voting pattern is legitimate and does no harm, while running the script does do harm in certain cases. MSO may be a special case, but we should stop running the script on the other metas. I find it hard to believe that it's so difficult for the script to detect and ignore a legitimate poll. After all, it's a simple combination of 1) question being posted at meta and 2) having two or more self-answers. If you voted only up (or only down), use this answer to cast an opposite vote. This way will prevent your votes from being reversed by the script that may mistakenly assume serial voting here. From what I know about script, one counter-vote post can serve up to 5 or even 10 poll items (assuming that voter wasn't trapped before - script has a "memory" and gets stricter if past reversals are discovered). This is the problem not only for voters, but also for the users like me who post many feedback-answers on a announcement-type question. Pretty please, make this reversing script more clever. While this is certainly a problem with how our current evaluations are set up... I'd say that this behaviour is more a side-effect of the fact that we're abusing meta to run these evals rather than a defect in the vote fraud detection. This is a very, very narrow edge case. Aside from these evaluations, I can't think of a legitimate case for one person to post a lot of answers to the same question. On a main site, it's likely that if a person posts multiple answers that they are (or at least should) offer some sort of a different perspective, so legitimately serially upvoting all of them wouldn't make a lot of sense. In a way, the vote pattern analysis already ignores votes done on the question and its answers since the answers are from different people. On a meta site, even for a question that's basically a poll, it is better to allow the community to post answers instead of having the same person prepare the question and the possible responses. The latter tends to stifle community participation as people feel discouraged from weighing in with their opinions instead of just voting on the pre-set answers. This is harmful, especially if those opinions aren't already captured by the existing answers. Even though meta posts (on SE 2.0 metas, at any rate) don't affect reputation, voting still carries meaning. Mad Scientist nailed it in this comment: targeting a user on meta isn't any more acceptable than targeting a user on a main site. So all in all, we will not be making changes to make meta a special case or otherwise support these epic site evaluation hacks. Instead, we're looking at how we can use /review to make these site evaluations more useful, natural, and easy to do. Stay tuned for more details on that in the customary 6-8 weeks. Not the answer you're looking for? Browse other questions tagged support bug status-declined serial-voting . Should this be picked up by the vote fraud detecting algorithm? Why do so many of my carefully researched MSO questions turn out to be duplicates? Is serial voting detection script run for meta-sites, too?